If you do this breakfast right, you only have to make the eggs and the Canadian Bacon that morning. I start a skillet on medium-high for the Canadian Bacon and brown it on each side (takes about 3-5 min each side). I start my eggs with just enough coconut oil to coat the bottom of a small pot on a medium heat. Crack the eggs directly in the pot and cover until the white is cooked through but yolk is soft and runny (approx 7 min but this will be based on your stove so keep an eye on it). I typically have chopped baked sweet potato or leftover rice in the fridge from my weekly lunch prep. So it is ready to get warmed up in the morning. I take a couple handfuls of greens and put it in a bowl. 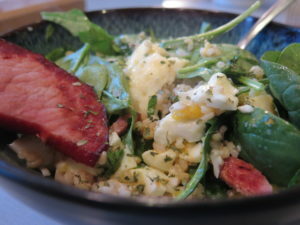 Rough chop the Canadian Bacon and throw that in the bowl, add your sweet potato or rice, and top with your eggs. I run my knife through the whole bowl to chop and mix it together. Salt and pepper to taste.